In 1974, Martine and Bernard Giacometti acquired an old hotel restaurant and created La Bazenne. La Bazenne has quickly become a key institution of the North of Île de Ré Island where stars and other French elite meet on the terrace for morning coffee, lunch, crepes, evening cocktails, dinner and late night drinks. It is a true “lieu de vie” (place to be, see and be seen) and was launched to last for generations of enjoyment and memories. 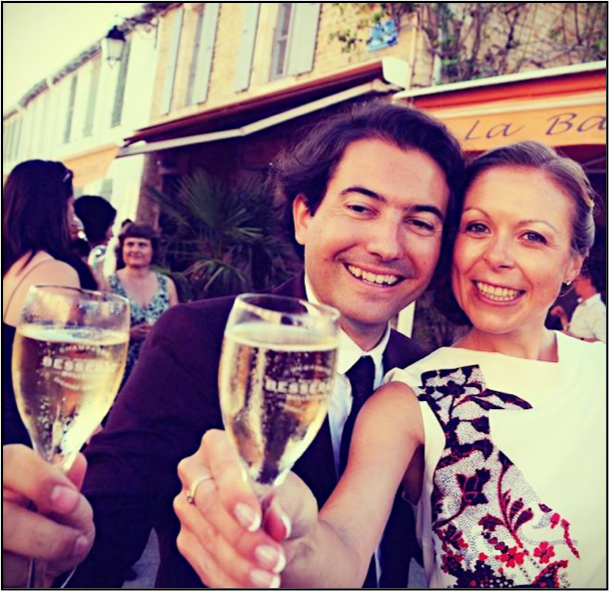 In 2013, Amy and Romuald with the support of Bernard Giacometti decided to export the concept of La Bazenne to the United States, in Naples, Florida. La Bazenne on Fifth draws heavily on the inspiration of the original La Bazenne in île de Ré, France, offering modern French, local and healthy cuisine alongside signature drink pairings and a social club twist. Whether you are a year-round Naples resident, a seasonal regular, or a first time tourist, we look forward to welcoming you to La Bazenne’s newest home on the Florida shores to share our love of French culture and cuisine. 1) Modern French – Meal times in France are a daily celebration that never go out of style. However, French cuisine has changed over time to incorporate new and international influences that appeal to modern palates. 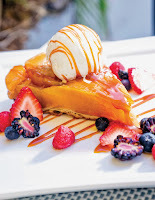 La Bazenne on Fifth was born out of a shared observation between the founders that a great opportunity exists in the U.S. to develop the authentic "lieu de vie" (a place to feel at home) that represents modern French café-restaurants, or more broadly the "Café-Culture“. At La Bazenne on Fifth, we offer simple but innovative cuisine, appealing to casual passers-by and regular guests of simple or sophisticated palates. We are an all-day, full service dining establishment where you are invited to join us for a taste of modern France , whether it’s a homemade croissant or crepe to kick off your day or a perfectly paired wine and food menu to enjoy with family or friends. 2) Local and healthy – La Bazenne on 5th offers a customized menu to appeal to local tastes that builds on collaboration with locally-based natural food producers . We aim to build and expand on our 40-year history by drawing on the best products and French-inspired delicacies that the local market has to offer. 3) Social Twist – In order to replicate the “home-away-from-home” feel of neighborhood café-restaurants throughout France, La Bazenne on 5th offers a myriad of social events for Club Members and guests throughout the year. Apart from these events, however, you are always welcome to linger over a café in a comfy chair in our indoor or outdoor terraces or to organize your own social gathering at our lively bar over signature drinks and food pairings. One of the strengths that make La Bazenne such a successful institution with a world class reputation is its attentive and friendly staff. Made up of a team of professionals whose priorities are attention to detail and excellent personal service, La Bazenne staff feel affectionately about making every visit into a personalized experience. • Romuald has 8 years of international consulting experience, 3 years of Internet Start-up management experience and 30+ years of family restaurant involvement. • The last 8 years he was based in Paris as a consultant for Schlumberger Business Consulting (SBC), the leading Oil & Gas Strategy Consulting firm. He managed projects in Strategy, Finance, Human Resources and Operation Improvement for global companies in North and South America, Africa, Middle East and Europe. • His main experience outside of Oil & Gas consulting is his continuous involvement in the Family restaurant business through a sequence of advisory periods from annual revamping of the menu, dish tasting, wine pairing, to competition for business expansion. • Previously he also co-founded a Social Network platform focused on Fashion (cloziz.com) following an experience as Strategy Marketing Consultant for a Software Company the UK. • Romuald attended a Summer Executive Program at INSEAD, Fontainebleau, France, and holds a Masters of Science in Management from EM Lyon, France. • He speaks native French, English and conversational Spanish. • Amy has 12 years of international consulting and banking experience. • She has spent the last 5 years working at Schlumberger Business Consulting (SBC), the leading Oil & Gas Strategy Consulting firm. Based in London and Paris, she worked with some of the world's largest energy companies across Europe, Africa, Middle East, and the Americas. • Before joining SBC, Amy was a Consultant with Booz Allen Hamilton for 5 years, based out of DC and London. She was also with the Asset Management Division of Goldman Sachs, and was a Consultant at FACTS, Inc. energy consultancy. • She is passionate about social networking and community service. She is a member of the Junior League, the National Association of Professional Women and Business Women Connect. As an MBA without Borders, she also launched the first major export business out of Mali for Hallmark as part of Project Red© . • She speaks native English and fluent French. • Bernard has 40 years of hospitality industry experience. He co-founded La Bazenne Café-Restaurant in Les Portes en Ré, France in 1974 with Romuald Giacometti's mother, and still runs it with joy and professionalism. • La Bazenne is a 200-seat capacity Café and Restaurant, with a 150-seat outside dining area which welcomes guests all-day-long every day of the summer season. It caters to mostly mid-upper-class businessmen, politicians, actors, and people of the entertainment industry as well as their families. Thanks to the picturesque island environment, its lively villages, and hosts like Bernard, l'île de Ré has become one of the two favorite spots for vacations in France, alongside Saint-Tropez. • Bernard has made La Bazenne into an institution where one has to be and be seen. In addition to being the leading café-restaurant on the Island, Bernard keeps fighting to stay at the top of the service industry. • Previously, Bernard co-owned and ran for a couple of years a 2,000-person-capacity entertainment complex with restaurants, bars and dancing areas in Bordeaux, France. • Bernard has License to sell alcoholic beverage and to stay open late at night. • He also holds a Diploma as a Certified Electrician. • He speaks native French and is comfortable in English conversations. and in fact I was about to mention some importance of new homes Parish FL in my comment below. Interesting article! To open you own restaurant you need to buy ravintolakoneet at good prices. Hello very nice website!! Guy .. Excellent .. Wonderful .. I will bookmark your blog and take the feeds also…I’m glad to seek out numerous helpful information right here in the submit, we’d like work out more techniques on this regard, thanks for sharing.